The local playground is one of our favourite destinations for an outing. Fortunately it is only a short walk so there’s no need to get out the car. On the way we look at the local gardens and talk about what we see. We stop and say “Hello” to a neighbour’s dog behind his gate and sometimes we spot a cat as well. I seize the chance to talk about road safety as we cross driveways keeping an eye out for cars and then look carefully in both directions before we cross the road. Our safety rule is that we always walk next to each other with the younger grandchildren holding my hand as we cross the road. Usually I make sure we take a drink bottle and small snack with us. 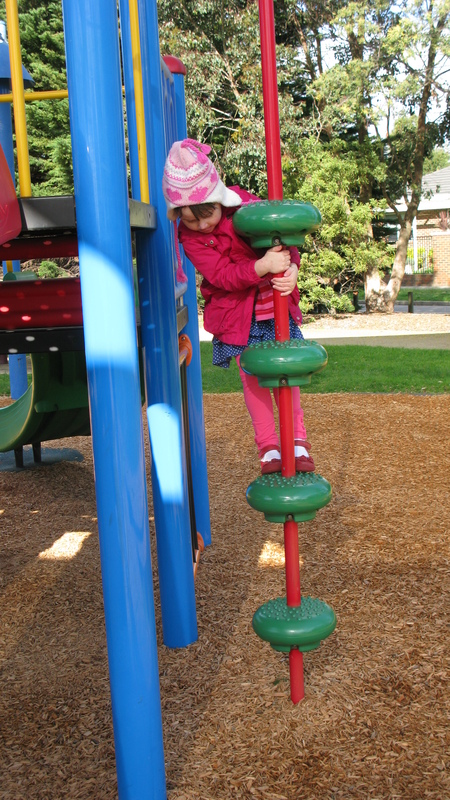 Playing is a child’s work and climbing, swinging, balancing and sliding build up an appetite. It is fascinating to watch physical dexterity and the determination of young children to master new skills develop over the pre-school years. The joyful cry, “I did it!” always brings a smile to my face.